Parents protest against Chabad approaching their children to discuss Judaism after school, claiming 'religious coercion'. Parents in Rehovot have accused representatives of the Chabad outreach organization of "religious coercion," after representatives approached their children after school to give their daughters Shabbat candles and offered their sons the opportunity to put on tefilin (phylacteries). "Why should my 16 year-old daughter be preached at Friday afternoon, at the school gates, about the importance of keeping Shabbat and lighting candles? Why is my 14 year-old son being approached to put on tefilin (phylacteries) on his way home from school? Why does no one stop this phenomenon, which as a mother I define as religious coercion?" Yediot Aharonot quoted one parent as saying. Chabad has also distributed pamphlets on guidelines for Jewish dress to their daughters, some mothers claim. But school officials for their part have stated that Chabad has been visiting for months, and that "what they are doing is not coercive, so we haven't filed a police report." They admitted that while they, themselves, see why parents might be upset at Chabad's actions, the only institution capable of changing the situation is the Rehovot municipality. Zohar Bloom, Rehovot's deputy mayor called the phenomenon "a problem", but admitted that the Chabad emissaries were not doing anything illegal. Chabad regularly distributes pamphlets with Jewish knowledge and Shabbat candles all over the world, as part of an outreach campaign to bring Jewish traditions to communities without vibrant Jewish communities. 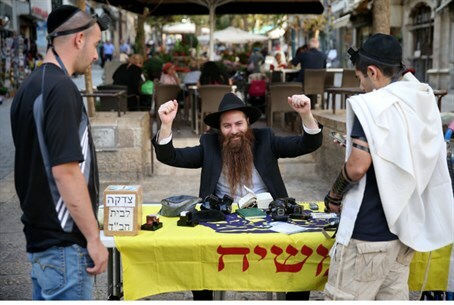 They also set up booths to complete certain commandments - such as tefilin during the year for men, and seasonal mitzvot like sitting in a sukkah - in major urban centers, to bring those traditions to the general public. Michael Reinitz, Chairman of the Rehovot Chabad branch, released a statement defending the move, stating that the aim is not to coerce students at all, but to approach them with knowledge and resources. Students are free to do what they wish, he said. "Chabad representatives are outside of the school building; they don't force anyone to put on tefilin - whoever wants to can do so, and whoever doesn't want to does not have to," he explained. "We don't force anyone [to do anything] and we are not violating the law."